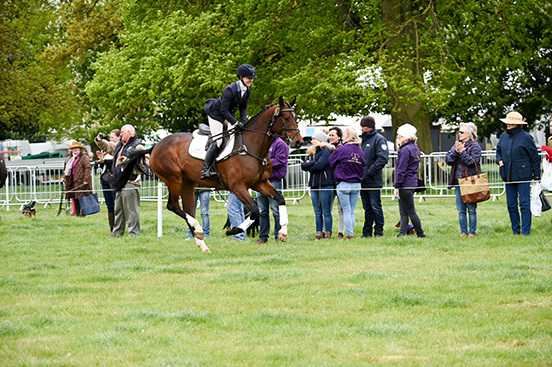 “You find out what you have when you take them out, and we’re very happy with what we have..."
UK based American event rider Tiana Coudray steered not one, but two young horses to victory, taking both the four and five-year-old Dubarry Young Horse Qualifiers at The Mitsubishi Motors Badminton Horse Trials. Her first win came aboard four-year-old bay mare Donna Sion, a beautiful stamp by Don Diarado, owned by Lucinda Campbell. Michael Egan’s MD Sandyhill Penhills Zorro, by Sligo Candy Boy, occupied second spot, ridden by Bernie Whafe. Jasmine Watson was third on Joanne Pullan’s bay gelding Grafiba. Royaldik son Hullabaloo, took the five-year-old honours, completing Tiana’s double. The bay gelding arrived with Tiana in January and compete in his first horse trials recently. ‘Baloo’ was foaled at his owner Nicola Burton’s Wrestow Stud. “I ended up buying him as he grew too big for his previous owner, and he will hopefully become my 15-year-old son’s eventer,” explained Nicola. Tiana is no stranger to young horse success. In 2015 she won the Five Year Old Dubarry Burghley Young Event Horse final with Cavalier Crystal. The five-year-old runner up spot went to Nick Gauntlett’s Party Trick by the legendary Chilli Morning, and third place was awarded to Gilly Kinloch’s Monbeg Odyssey ridden by Georgie Strang.